Know anybody that’s had their computer crash? Did they lose any of their valuables? Pictures, music, financial records? It’s a painful experience yet for most of us the answer is “Oh, my, god, YES.” The bad news is if you own a computer the question is not IF it will fail but WHEN it will fail. So what to do? Get redundant. Huhh? Okay, I’ll make this simple. Answer the question “How important is my data?”. Now, look for your answer below. Your redundancy solution will follow including approximate cost. (3) My Data is Important to Me. Solution: Setup Time Machine to automatically backup versions of all important files on your computer. Now that sounds fancy! How do I implement this fanciness? If you have a Mac it’s easy. First, I suggest you buy a highly rated external hard drive that has at least two to three times the storage space as your computer. If you buy something like the G-Drive, it’s plug and play for the Mac so you just plug it in, open the Time Machine settings on your Mac. Before you turn Time Machine on select your new external hard drive by clicking Select Disk. Choose your new hard drive from the list and click Use for Backup. Turn Time Machine to ON. That’s it. You’re set! 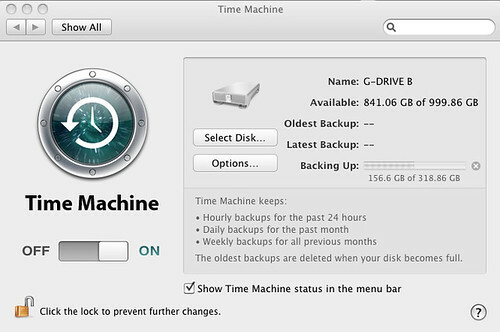 Time Machine automatically saves up-to-date copies of everything on your Mac. This includes all of your photos, music, videos, documents, applications, and settings. If you ever have the need, you can easily go back in time to recover anything. Cost? Depends on the hard drive you buy. The G-Drive is around $160 but it’s one of the best. However, you can get by much cheaper. 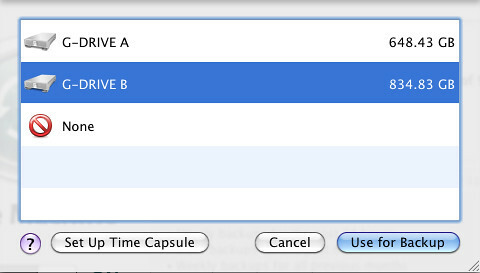 The Time Machine application comes with your Mac so it’s free. Windows user? Like I said, my personal computer is a Mac. Therefore, I have implemented a Mac based solution. Windows users can set this up in much the same way but will need to use different software. Do a Google Search for “Time Machine for Windows” or check out Genie9 which looks pretty slick. Additional Cost: $40. (4) My Data is VERY important to me. Solution: Implement everything in number three and consider including one or more of the following. Bonus Solution No. 1: Use an online backup service such as Backblaze. I give credit to a friend of mine for doing the research and recommending this service to me. Cost? For $5 a month I can have a secure hassle free backup of all my data. Come fire. Come flood. I’m backed up. Bonus Solution No. 2: Backup offsite. Backblaze is easy and online, and thus, offsite. However, if your data is mission critical I suggest backing up to an external hard drive once a week / month and carrying the drive to an different secure location. Offsite = not at your house or office or wherever your primary data source is located. Cost? The cost of another (I suggest identical) hard drive and your time transporting it offsite (maybe to a friend’s house). Bonus Solution No. 3: Whenever I upload new pictures I save them to my local drive but I also save a copy to my HP Media Server. I call the local copy Livework and the server copy Rawdata. I picked up this naming convention and much of the inspiration for this project from Chase Jarvis. Cost? Servers aren’t cheap. Is this overkill? Perhaps. I also have more insurance than I probably need. Unless of course I need it.